Discovered in 1940s, ozone has been used for water sterilization and disinfection for the last 20 years or so. There are only two ways for ozone to act on pollutants in water. One is direct oxidation, which is the ozone molecule action on pollutants directly. The other way is indirect oxidation, The partial decomposition of ozone produces hydroxyl radicals and organic matter in water. The indirect oxidation reaction is quite fast, non-selective, and can react with various pollutants. The following points should be noted when using these chemical methods of sterilization in the swimming pool. 1.The half-life of ozone in water is only about 3-18 minutes of existence, and the filtration cycle of pool water is much larger than it. Therefore, ozone does not disinfect overall after entering the swimming pool, which causes some part of the water in the swimming pool may be incompletely sterilized. So the swimming pool cannot be sterilized by ozone alone, instead it must be supplemented with some chlorine disinfectants or using ozone stabilizers to extend the time of ozone effecting in the water. 2.Ozone has a strong ability to oxidize, which decomposes the organic matter into simple molecules, and these molecules do not enter the ozone reaction process with the water flow. So they could become the essential nutrition for the growth of green algae. As a result, the pool wall or pool angle is prone to grow green algae. The ozone concentration in pool water can not kill the green algae, so there will be eugenic screening and drug resistance problems, which is another reason of adding chlorine disinfectants or ozone stabilizers into the ozone tank. 3.The reaction mechanism of ozone in the swimming pool is destroy the human body's metabolism of ammonia, nitrogen organic matter at first(such as sweat, urine, nasal mucus, epitasis Dandruff, etc. )and then kill the microorganisms in water. When the using peak of swimming pool, the ozone takes care of filtering water instead of the sterilization. In other word, when there are many swimmers, it is possible to provide the growth conditions of the coliforms. Therefore, the operation time of ozone generator should not too short. 4.Ozone can decomposes organic matter in a short time, and the process of oxidizing chlorine is slow. So when using ozone, it should be positioned to treat the organic matter, so that the pool water does not have the opportunity to combine chlorine. That is to say, the arrangement of the pipeline system should render pool water first to contact the ozone to decompose the organic matter and then operate chlorination process, which avoids the smell of chlorine odor is generated, or the ozone and chlorine mutually destruct. 5.The diffusion efficiency of ozone is determined by the size of the bubble. The smaller surface area of the bubble, the greater chance of contact with water. Therefore, too large bubble is not only has bad efficiency, but also produces unreacted ozone inclusion in the bubble. When bubble with ozone overflows, it will cause respiratory tract burns while humans are breathing. 6.The ozone CT value(C for concentration, T for time) is one of the main design parameters of the ozone generator and disinfection system. For example, the ozone generator has an ozone concentration of 0.4 mg/L, and the contact time is 4 min. So the CT value is 1.6. 7.The oxidation of ozone has a micro-flocculation capability. When the ozone is completely contacted in a effective CT value, after that it enters the pipeline system of the screening procedure. The micro- flocculation capability show much effectivity, requiring only a small amount of enzyme clarifying agent. it is easy to maintain the water's perspective above 70 meters. 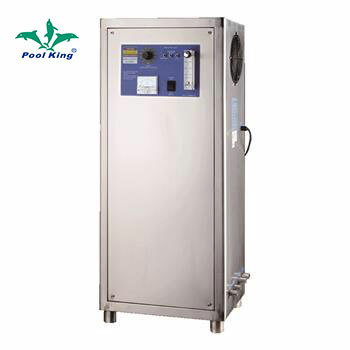 8.The ozone system can not be used for mineral springs or hot spring, because mineral spring or hot spring contain large of iron ion, manganese ion and organic matter. The addition of ozone to water with this characteristic is mostly used as neutralization and oxidation, followed by discoloration of iron and manganese from pool. High temperature is also one of the characteristics of this pool water, and is another major factor that is not suitable for the ozone system. In practice, ozone is present in pool water above 38 degrees Celsius and is difficult to exist for more than 30 seconds. So it is nearly impossible to reach the effective CT value of ozone in such a short contact time.